Founded by Tracey Martin and Tonya Hurley, a pair of twins who grew up in the funeral parlor business, Morbid Anatomy recently expanded into a huge new space in Gowanus that houses a museum, library, cafe and learning center. (If you can’t swing the $50 admission to the grand opening party tomorrow, the inaugural exhibition opens Saturday). The empire of death was actually founded seven years ago, around the time Divya got her start as well. Back then, the rogue taxidermist found it difficult to find a mentor. “There are not a lot of traditional taxidermists who are willing to teach someone, especially not some random person living in Brooklyn,” she explained. shaping/sculpture tools, or really anything that can be used to delicately press and shape the skin without piercing it. a pair of pliers for shaping the wires, and stripping the pipe cleaner fluff. a small, round object to stretch the skin over. Put your gloves on and set up your workspace like this. Be mindful of where you place your dirty tools. Keep a spray bottle with a mix of alcohol and water close at hand for cleaning up messes. Make a dorsal incision along the mouse's back. Avoid cutting too deep. Gently separate the carcass from the skin, and do your best to keep the innards all in one piece. Next, remove the tail meats– it should slide out with the rest of the carcass. Don't throw the carcass away. Put it in a separate workspace, away from the clean stuff. You're going to need it later for reference. Your pelt should look something like this. Next, gently stretch the skin over a round, hard object that can be cleaned later on, or one that you don't mind throwing out. Divya uses an egg-shaped piece of wood. Next, use the scalpel to strip off what Divya calls "the goop" (i.e. the connective tissue between the skin and the carcass.) Be careful not to penetrate the skin. Luckily, mice don't have too much goop, so this process is relatively speedy for these guys compared to other animals. But be sure to get off all that goop. "You want a skin that is as white. beige as possible," Divya said. Wash the pelt thoroughly with soap and water. Back at your workspace, let the excess water fall off air dry that guy while you make the form. Create stuffing using the wood wool. Now is the time to reference the carcass again. Wrap the body portion into a similar shape. Use a small chunk of clay to form a head. Dab the pelt thoroughly with dry preservative. Once the pelt has been given time to dry, insert the forms to create faux inner tissue. Weave the bare wires through the body to build the spine, arms, and legs. "The form is very important– taxidermy is all about putting in what you took out," Divya explained. Put the body and head forms into the skin. Use pliers to fasten the ends of the wires to the wood wool form, folding them over so they act like staples. Use the invisible string to sew up the incision on the mouse's back. Clip the string when you're all done. Blow-dry the mouse until dry. Fluff up the hair. "You can't let anything dry on its own," Divya said. "You have to tell everything where to go." Now comes the artful part. Use your sculpting tools to move the skin around. 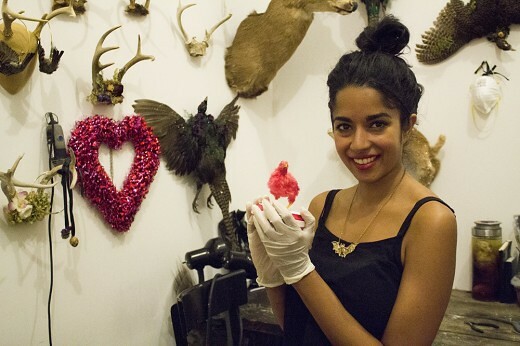 "Taxidermy comes from the Greek word meaning to push the skin around," Divya explained. As you mold the creature, it will start to look less like a corpse and more like a living mouse. Insert pins as a stand-in for the eyes. Once you have shaped his limbs, clip the wires. Next, pin the mouse to a mount. Strategically place pins as scaffolding. "Everything dries hard," Divya explained, so be sure your mouse is in the exact position you'd like it to be when it's finished. Monitor the drying process over the next couple of days closely. If something looks off, comb the fur or make other adjustments. Remember to clean up your work space using a disinfectant. Taxidermy is best left in a cool, dry place. "Treat it as you would a valuable fur or leather item and clean it regularly," Divya said. She also advised amateur taxidermists with pets to keep their pieces under glass domes. "A piece of treated mouse or bird skin can be very appealing to a pet, it can pique their curiosity."